The softest micro-fiber towels we could find, sold in a 3-pack for convenience. Everything you need to correctly apply and remove any cleaning product you use on your boat. Microfibers do all of the heavy lifting when it comes to cleaning and detailing, and you'll be amazed by how many applications you find for these ultra-soft towels. We tracked down the absolute softest microfiber towels we could find to ensure no damage occurs when you're working on your boat. This 3 pack includes different color towels so you can keep track of which one you use for glass cleaning, interior cleaning and exterior product application. You literally can't have enough of these towels, especially if your wife finds out how convenient they are for cleaning around the house. 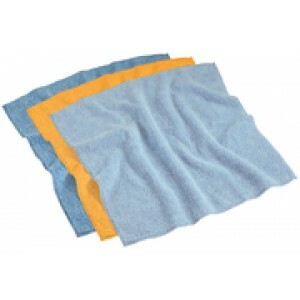 Apply or remove any product we sell by hand correctly and efficiently with these absorbant micro-fiber towels.